Full length native protein (purified) corresponding to Rabbit Calcium channel L type DHPR alpha 2 subunit/CACNA2D1. Voltage-sensitive calcium channels mediate the entry of calcium into many types of excitable cells and thus play a key role in neurotransmitter release and excitation-contraction (E-C) coupling. The 1,4-dihydropyridines (DHPs) are synthetic organic compounds which can be used to identify the L-type calcium channels that are found in all types of vertebrate muscle, neuronal and neuroendocrine cells. The DHP receptor is part of the L-type calcium channel complex and is thought to be the voltage sensor in E-C coupling. The purified DHP receptor isolated from triads is composed of at least four subunits. The alpha-1 subunit contains the binding site for the DHPs and shows high sequence homology to the voltage gated sodium channel. The alpha-2 subunit is a large glycoprotein associated with the DHP receptor which was first described in skeletal muscle and is also found in high concentrations in other excitable tissues such as cardiac muscle and brain and in low concentrations in most other tissues studied. The other two subunits that co-purify with the DHP receptor are termed beta and gamma. Our Abpromise guarantee covers the use of ab2864 in the following tested applications. WB 1/500. Detects a band of approximately 150 kDa (predicted molecular weight: 123 kDa). Isoform 1 is expressed in skeletal muscle. Isoform 2 is expressed in the central nervous system. Isoform 2, isoform 4 and isoform 5 are expressed in neuroblastoma cells. Isoform 3, isoform 4 and isoform 5 are expressed in the aorta. Belongs to the calcium channel subunit alpha-2/delta family. The MIDAS-like motif in the VWFA domain binds divalent metal cations and is required to promote trafficking of the alpha-1 (CACNA1) subunit to the plasma membrane by an integrin-like switch. Proteolytically processed into subunits alpha-2-1 and delta-1 that are disulfide-linked. Immunohistochemistry was performed on normal biopsies of deparaffinized human skeletal muscle tissue. To expose target proteins heat induced antigen retrieval was performed using 10mM sodium citrate (pH6.0) buffer and microwaved for 8-15 minutes. Following antigen retrieval tissues were blocked in 3% BSA-PBS for 30 minutes at room temperature. Tissues were then probed at a dilution of 1:100 with a Mouse Monoclonal Antibody recognizing Calcium channel L type DHPR alpha 2 subunit/CACNA2D1 (ab2864) or without primary antibody (negative control) overnight at 4�C in a humidified chamber. Tissues were washed extensively with PBST and endogenous peroxidase activity was quenched with a peroxidase suppressor. Detection was performed using a biotin-conjugated secondary antibody and SA-HRP followed by colorimetric detection using DAB. Tissues were counterstained with hematoxylin and prepped for mounting. Immunofluorescent analysis of Calcium channel L type DHPR alpha 2 subunit/CACNA2D1 in PC12 Cells. Cells were grown on chamber slides and fixed with formaldehyde prior to staining. Cells were probed without (control) or with a Calcium channel L type DHPR alpha 2 subunit/CACNA2D1 monoclonal antibody (ab2864) at a dilution of 1:20 overnight at 4 Cand incubated with a DyLight-488 conjugated secondary antibody. Calcium channel L type DHPR alpha 2 subunit/CACNA2D1 staining (green) F-Actin staining with Phalloidin (red) and nuclei with DAPI (blue) is shown. Images were taken at 60X magnification. Flow cytometry analysis of Dihydropyridine Receptor alpha 2 showing positive staining in the membrane and cytoplasm of SH-SY5Y cells compared to an isotype control (blue). Cells were harvested and adjusted to a concentration of 1-5x10^6 cells/ml. Cells were then fixed with 2% paraformaldehyde and washed with PBS. Cells were blocked with a 2% solution of BSA-PBS for 30 min at room temperature and incubated with ab2864 at 1:100 for 60 min at room temperature. Cells were then incubated for 40 min at room temperature in the dark using a Dylight 488-conjugated goat anti-mouse IgG (H+L) secondary antibody and re-suspended in PBS for FACS analysis. Additional bands at: 18 kDa, 50 kDa. We are unsure as to the identity of these extra bands. Calcium channel L type DHPR alpha 2 subunit/CACNA2D1 contains a number of potential glycosylation sites (SwissProt) which may explain its migration at a higher molecular weight than predicted. Flow cytometry analysis of Dihydropyridine Receptor alpha 2 showing positive staining in the membrane and cytoplasm of Neuro-2a cells compared to an isotype control (blue). Cells were harvested and adjusted to a concentration of 1-5x10^6 cells/ml. Cells were then fixed with 2% paraformaldehyde and washed with PBS. Cells were blocked with a 2% solution of BSA-PBS for 30 min at room temperature and incubated with a2864 at 1:100 for 60 min at room temperature. Cells were then incubated for 40 min at room temperature in the dark using a Dylight 488-conjugated goat anti-mouse IgG (H+L) secondary antibody and re-suspended in PBS for FACS analysis. Flow cytometry analysis of Dihydropyridine Receptor alpha 2 showing positive staining in the membrane and cytoplasm of C6 cells compared to an isotype control (blue). Cells were harvested and adjusted to a concentration of 1-5x10^6 cells/ml. Cells were then fixed with 2% paraformaldehyde and washed with PBS. Cells were blocked with a 2% solution of BSA-PBS for 30 min at room temperature and incubated with ab2864 at 1:100 for 60 min at room temperature. Cells were then incubated for 40 min at room temperature in the dark using a Dylight 488-conjugated goat anti-mouse IgG (H+L) secondary antibody and re-suspended in PBS for FACS analysis. Immunofluorescent analysis of Calcium channel L type DHPR alpha 2 subunit/CACNA2D1 in U251 Cells. Cells were grown on chamber slides and fixed with formaldehyde prior to staining. Cells were probed without (control) or with a Calcium channel L type DHPR alpha 2 subunit/CACNA2D1 monoclonal antibody (ab2864) at a dilution of 1:100 overnight at 4 C and incubated with a DyLight-488 conjugated secondary antibody. Calcium channel L type DHPR alpha 2 subunit/CACNA2D1 staining (green) F-Actin staining with Phalloidin (red) and nuclei with DAPI (blue) is shown. Images were taken at 60X magnification. Immunofluorescent analysis of Calcium channel L type DHPR alpha 2 subunit/CACNA2D1 in HeLa Cells. Cells were grown on chamber slides and fixed with formaldehyde prior to staining. Cells were probed without (control) or with a Calcium channel L type DHPR alpha 2 subunit/CACNA2D1 monoclonal antibody (ab2864) at a dilution of 1:100 overnight at 4 C and incubated with a DyLight-488 conjugated secondary antibody. Calcium channel L type DHPR alpha 2 subunit/CACNA2D1 staining (green) F-Actin staining with Phalloidin (red) and nuclei with DAPI (blue) is shown. Images were taken at 60X magnification. Immunohistochemistry was performed on normal biopsies of deparaffinized mouse skeletal muscle tissue. To expose target proteins, heat induced antigen retrieval was performed using 10mM sodium citrate (pH6.0) buffer, microwaved for 8-15 minutes. Following antigen retrieval tissues were blocked in 3% BSA-PBS for 30 minutes at room temperature. Tissues were then probed at a dilution of 1:200 with a Mouse Monoclonal Antibody recognizing Calcium channel L type DHPR alpha 2 subunit/CACNA2D1 (ab2864) or without primary antibody (negative control) overnight at 4ºC in a humidified chamber. Tissues were washed extensively with PBST and endogenous peroxidase activity was quenched with a peroxidase suppressor. Detection was performed using a biotin-conjugated secondary antibody and SA-HRP followed by colorimetric detection using DAB. Tissues were counterstained with hematoxylin and prepped for mounting. 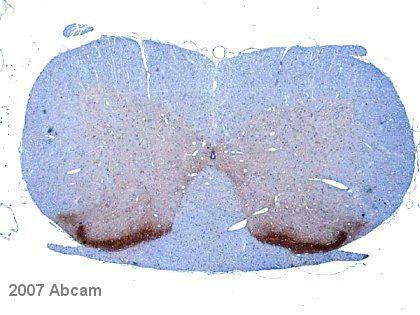 Immunohistochemistry (Frozen sections) - Anti-Calcium channel L type DHPR alpha 2 subunit/CACNA2D1 antibody [20A] (ab2864)This image is courtesy of an anonymous abreview. IHC-Fr image of anti-Calcium channel L type DHPR alpha 2 subunit/CACNA2D1 staining with ab2864 on tissue sections from chicken hindbrain. The sections were blocked with 3% BSA for 1 hour at 4°C, before incubation with ab2864 (1/1000 dilution) for 16 hours at 4°C. The secondary was an Alexa-Fluor 488 conjugated goat anti-rabbit polyclonal, used at a 1/1000 dilution. 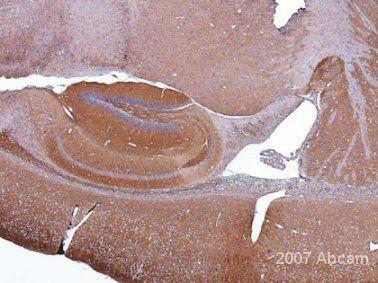 ab2864 at 1/250 staining mouse brain tissue sections by IHC (Formalin/PFA-fixed paraffin-embedded sections). The tissue was formaldehyde fixed and a heat mediated antigen retrieval step was performed. The tissue was incubated with the antibody for 16 hours. A biotinylated goat polyclonal antibody was used as the secondary. ab2864 at 1/500 staining rat spinal cord tissue sections by Immunohistochemistry (Formalin/PFA-fixed paraffin-embedded sections). The tissue was formaldehyde fixed and a heat mediated antigen retrieval step was performed, prior to incubation with the antibody for 16 hours. A biotinylated goat polyclonal antibody was used as the secondary. Observed band size: 143 kDa why is the actual band size different from the predicted? Overlay histogram showing SH-SY5Y cells stained with ab2864 (red line). The cells were fixed with 80% methanol (5 min) and then permeabilized with 0.1% PBS-Tween for 20 min. The cells were then incubated in 1x PBS / 10% normal goat serum / 0.3M glycine to block non-specific protein-protein interactions followed by the antibody (ab2864, 1/200 dilution) for 30 min at 22°C. The secondary antibody used was DyLight® 488 goat anti-mouse IgG (H+L) (ab96879) at 1/500 dilution for 30 min at 22°C. Isotype control antibody (black line) was mouse IgG2a [ICIGG2A] (ab91361, 1µg/1x106 cells) used under the same conditions. Acquisition of >5,000 events was performed. Publishing research using ab2864? Please let us know so that we can cite the reference in this datasheet. Thank you for your enquiry and interest. This is a Mouse monoclonal [20A] to Calcium channel L type DHPR alpha 2 subunit so the host species of this primary antibody is mouse. The isotype is IgG2a so the compatible secondary antibody should recognize mouse IgG2a. The host species of the secondary antibody can be goat, rabbit, donkey, horse etc. If you wish to use enzyme-based detection system then the secondary antibody can be ALP or HRP-conjugated. This antibody should recognize alpha2delta1. There are 5 isoforms of this protein and the isoform 2, 4, and 5 are present in neuroblastoma cells. I have tested the presence of this protein in HEK293 cells and I found that is present. In the meantime I also tested its presence in mouse N2a and it seems to be absent. The lane is blank. I am wondering why. One possibility is that this antibody doesn't recognize the isoform present in N2a. Is that possible? What is the exact epitope of this antibody? Does it recognize all the isoforms of the protein? No epitope mapping has been completed for this product. The immunogen is rabbit dihydropyridine receptor. We do know that this product shows positive signal in Western Blot for mouse brain and IHC for rat brain. Could there be low expression in mouse N2a? Is it possible to retest with a higher ug amount on the Western Blot? I would be very happy to help work with you to achieve the best possible data using this product. If you could provide the details of your protocol including sample preparation, troubleshooting and any images, I will be very happy to review these for you. Thank you for contacting us. Epitope mapping has not been performed for the monoclonal antibodies ab2864 and ab88486. The other antibodies are polyclonals and will bind at many different sites of the protein. Please let me know if I can be of further assistance. Is it possible to get a blocking peptide for this antibody? The antibody, ab2864was made to a native protein, and therefore, it is not available as a synthetic blocking peptide. We unfortunately do not have any of the protein available to provide either. Thank you for contacting Abcam Technical Team and for taking the time to provide some useful details of the experiments. I am very sorry to hear that your customer is having problems with this product. Though you have kindly provided some details, it would be much appreciated if I could get some more information which would help me identify the source of the problem. - Could you please specify the cell type of the mouse cells used for these experiments? - Total cell lysates or membrane preparations have been run on the gel? I look forward to hearing from you soon. Does your antibody work on paraffin-embedded tissue samples and is there any availability evidence of reactivity with cardiac DHPR a2 subunits? (I noticed that the Western blot trials and the background references listed on the datasheet were all done using skeletal muscle DHPR subunits). Thank you for your enquiry. Ab2864 detects 1,4 dihydropyridine (DHP) receptor alpha 2 subunit from human, rat, mouse, guinea pig and rabbit skeletal and cardiac muscle. 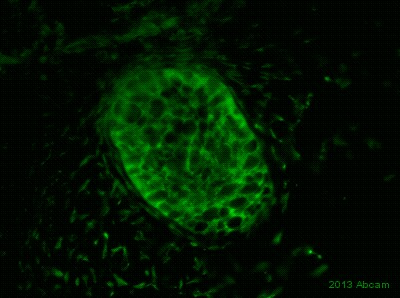 To our knowledge, this antibody has yet to be tested in IHC on paraffin-embedded tissue sections. All tested applications are specified on Abcam product datasheets. If you decide to go ahead and purchase this product, please let us know how you get on by submitting an Abreview and in return we will award you 50 Abcam Points, which can be redeemed on a number of rewards (a further 100 Abcam Points will be offered for an image). I hope this information helps, please do not hesitate to contact us if you need any more advice or information. I am undertaking immunohistochemistry work involving conjugating your antibody to quantum dots for imaging L-type Ca channels in the ventricular wall of the heart. I was wondering if you could provide assistance with the following questions: 1) Is your antibody compatible with paraformaldehyde for tissue fixation? 2) To approximately what depth will the antibody penetrate heart tissue (this would be useful for determining section sizes) 3) With regard to secondary Abs, is it possibly to use any anti-IgG2a antibodies or is it advisable to use of the secondaries listed on your website? Please find the answers to each of your three questions below: (1) We are not aware of this antibody having been used on paraformaldehyde fixed tissues. As you have no doubt seen from the datasheet, it has been used in IHC on frozen sections. (2) I am unable to comment on the depth that the antibody will penetrate heart tissue as this will depend on the precise conditions of your experiment, nature of material used and how the tissue has been prepared (3) Any anti IgG2a secondary will recognise this primary antibody. If you don't have a suitable antibody already in your lab, I'd certainly recommend that you try one of our recommended secondaries.